Search For "Automotive Services" Companies in Coeburn, Virginia - Click Here Now! Big Bertha's Towing And Equipment Delivery In Coeburn Virginia Is A Licensed And Insured Towing Company That Serves All Of Wise County And The Surrounding Southwest Virginia Area. Big Bertha's Towing Provides Light To Medium Duty Towing Service, Which Means We Provide Towing And Delivery Service For Vehicles, Equipment, Machinery, Parts, Materials And General Cargo To 26,000 Pounds. Big Bertha's Will Tow Your Car Or Truck 24/7 To The Facility Of Your Choice Where Necessary Repairs Can Be Made. Big Bertha's Towing Also Provide Essential Emergency Road Services Including: Towing, Tire Changes, Jump Starts, Fuel & Water Delivery, Lockout Service And Customer Transport And Cell Phone Service. Big Bertha's Towing Invoices Are Reimbursable And Accepted By All Automobile Insurance Company's Emergency Road Service Programs Such As PHP, ARI, Nationwide, State Farm And Others. Big Bertha's Towing Works Together With Automobile Motor Clubs Such As GEICO And Allstate. We Are An Authorized Police Rotation. If Any Of Your Organizations' Members Are In Need Of Emergency Roadside Services, Remember That Big Bertha's Are Only A Phone Call Away At 276-395-2358 Or Toll Free At: 866-850-9386. Please Consider Big Bertha's Towing And Equipment Delivery An Integral Part Of Your Organizations Emergency Road Service Network. Proud To Be A Member Of The TRAA & Wise County Chamber Of Commerce. 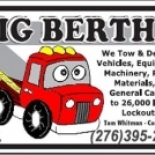 Big Bertha's Towing in Coeburn is a company that specializes in New & Used Car Dealers. Our records show it was established in Virginia.